Table 8.5. Spoilage organisms of bread. Aspergillus niger Aspergillus glaucus Aspergillus flavus Penicillium sp. Rhizopus nigricans Mucor sp. Given that biological spoilage of bread is caused primarily by molds, it is not surprising that preservation strategies have focused on controlling fungi, both in the production environment and in the finished product.As noted previously, mold and mold spores are present in flour and other raw materials and may be widespread in bakeries.Therefore, rigorous attention to plant design and sanitation is essential. The post-production environment (i.e., baked products) should be separated from pre-production environments. Air handling systems should be designed (including the use of filters or ultraviolet lamps and positive air pressure) such that airborne mold spores cannot gain entry to the product side. Figure 8-10. Spoilage of bread by fungi. Shown are Penicillium commune (A), Aspergillus niger (B), Pencil-lium roqueforti (C), and Rhizopusstolonifer (D). Photos courtesy of A. Bianchini and L. Bullerman, University of Nebraska. the United States, the most common means of bread preservation is to use propionate salts (Box 8-3). 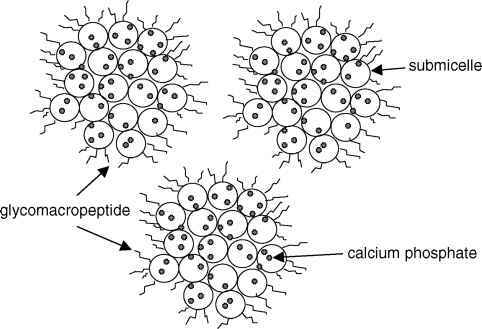 Calcium propionate is especially effective against most of the molds associated with bread, and is widely used in commercially-produced products. Sorbate and acetate salts are also used as anti-mycotic preservatives in bread. However, these acids also have inhibitory activity against baking yeasts, whereas propionates are much less inhibitory. Moreover, calcium propionate has no flavor or toxicity, is active even against rope-forming bacteria, and is effective in most varieties of bread.There are, however, some fungal strains (e.g., Penicillium roquefortii ) that are associated with rye breads and that are insensitive to propionates. Due to interest in chemical additive-free breads, alternative approaches for bread preservation have been considered. Bread can be exposed to ultraviolet, infrared, or microwave radiation to inactivate mold and mold spores or packaged in modified or vacuum atmospheres to inhibit their growth. These methods, however, are not widely used. In contrast, one effective method used for bread preservation that is very popular and does not involve addition of chemical preservatives instead relies on growth of lactic acid bacteria in the dough.As discussed above, these bacteria produce lactic and acetic acids and lower the pH to levels inhibitory to most fungi. Another indirect way to extend the shelf-life of bread is via freezing. Many bread manufactur ers freeze the baked and packaged breads as a means of preserving the bread prior to delivery. Another freezing method that has been adopted is to freeze un-baked breads (Box 8-7). This process is gaining popularity, since it allows retailers to do the baking and then sell "fresh"-baked breads (aroma and all) at the retail level. Assessing the quality of bread is a very subjective process. Cultural, ethnic, and personal attitudes certainly influence the sort of bread an individual prefers. For example, the hard, crusty baguette eaten in France bears little resemblance to the soft, doughy, plastic-wrapped French bread preferred by many U.S. con-sumers.Whole grain peasant breads—so-named because centuries ago expensive refined flours went to the upper classes, while the poor were left with unrefined, whole flours—are now popular in specialty bakeries serving an affluent, upscale clientele. One of the hottest trends in the baking industry is the use of frozen doughs.These doughs are especially appealing to small retail bakery operations (like those in grocery stores), because they eliminate the need for dough production equipment and labor, while at the same time making it possible to offer fresh-baked bread products to customers. Frozen doughs are particularly convenient for the end-user. The frozen dough is simply removed from the freezer, thawed overnight in the refrigerator, given a final proof, and baked. Despite these advantages, however, the quality of breads made from frozen doughs can be quite variable, due to the loss of yeast viability during storage. Doughs made using cold-sensitive yeasts not only require longer proof times, but the bakers'yeast strains ordinarily used for bread manufacture are so cryosensitive that they may fail to provide any leavening at all after the dough-thawing step.Therefore, for frozen dough manufacture, it is essential that the yeast strain be cryotolerant. What makes some yeast strains resistant to the effects of freezing? And what can be done to improve cryotolerance? These questions are now receiving much attention, and the answers are, at least in part, inter-related. First, it appears that cryotolerance in Saccharomyces cerevisiae is due the ability of the organism either to transport extracellular cryoprotectant solutes from the environment or to synthesize them within the cytoplasm. These solutes, much like osmoprotectants, are then accumulated to high intracellular concentrations, without causing detrimental effects on the enzymatic or reproductive machinery within the cell. At a molecular level, these agents prevent dehydration, presumably by re-structuring the bound water in the cytoplasm. Microbial cryoprotectants are typically small, polar molecules and include several amines (e.g.,betaine, carnitine, proline, and arginine), as well as various sugars. In S. cerevisiae,the disaccharide trehalose (which consists of two glucose moieties linked a-1,1; Figure 1, upper panel) is probably the most important cryoprotectant (although some amino acids also have cryoprotective activity).When the temperature decreases (or when other environmental stresses are applied), the cell responds by increasing de novo synthesis of tre-halose. Extracellular trehalose, if available, may also be transported via a high affinity trehalose (a-glucoside) transport system. Ultimately, intracellular levels can reach up to 20% of the total weight of the cell (on a dry basis). The trehalose concentration in yeasts is not always maintained at such a high level. Rather, there is a balance between trehalose synthesis and metabolism, such that under non-stress conditions, the enzymes used to synthesize trehalose (the trehalose synthetase complex) are turned off and the hydrolytic enzymes (trehalases) are turned on (Figure 1, lower panel). 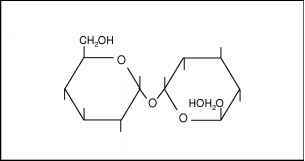 Tre-halose, it is important to note, can also serve as a storage carbohydrate in S. cerevisiae, providing a readily metabolizable source of energy for when exogenous sugars are in short supply. The coordination of the catabolic and anabolic enzymes, combined with the trehalose transporter, therefore, allows the cell to modulate the intracellular trehalose concentration, depending on the particular circumstances in which it finds itself.This system, however, can also be manipulated genetically for very practical purposes. If, for example, the trehalose degradation pathway is blocked, then higher levels of trehalose can be maintained, making the yeast more cryotolerant. One recently described strategy involved inactivation of genes encoding for an acid trehalase (Ath1p) and a neutral trehalase (Nth1p).When yeasts containing these defective genes were used to make frozen doughs, cryotolerance was enhanced, as observed by the increase in gassing power (CO2 produced per minute) in the thawed doughs. Is fermented food considered Alamo acid food or how are affluent?